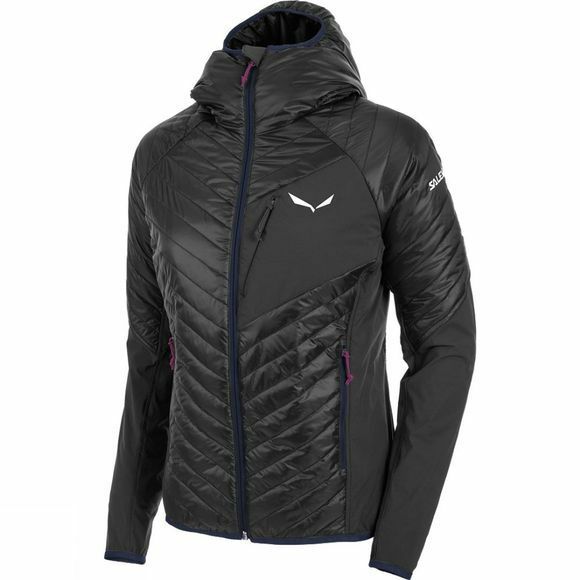 The Womens Ortles Hybrid 2 PrimaLoft Jacket is a windproof, water–repellent hybrid jacket that provides insulation during alpine mountaineering activities. It’s a favourite with Salewa athletes both in the mountains and in everyday life. Developed with the athletes it provides professional–grade insulation combined with freedom of movement for activities such as alpine mountaineering, ski mountaineering, alpine climbing and ice climbing, the Ortles Hybrid two PRL Jacket has been designed according to the Salewa body mapping system, using targeted materials for different body parts to provide the right performance at each area. The result is a hybrid jacket, with the chest, back and arms protected by Primaloft Silver 60g insulation, which is breathable, quick drying and engineered to offer effective warmth, even when wet. At the chest, side panels and under the arms, two–way stretch and abrasion–resistant Durastretch fabric inserts give the required comfort and freedom of movement.